If you missed “Day One” click HERE. Hop between our Designers to see what they have created with all of our New Products. Each day you will have a chance to win a $10.00 Gift card to My Treasured Kutz store, along with a “FREE” SVG Digital Cut File per day, and a 25% discount code for any purchase at My Treasured Kutz for the month of July. To participate, please visit each of the Designers’ Blogs for inspiration for all the Christmas Products. Comment and show them some love for all there hard work. We will choose One Winner each day to receive the $10.00 Gift Card to My Treasured Kutz store. The winners will be posted Saturday, July 11th on the My Treasured Kutz Blog. So check back and follow the instructions posted there if you are one of the winners. Also, as your hopping between blogs, look for the post with the link for the Daily “Free” Digital File and the 25% Discount Code. What fun it is to create and push yourself in new ways. 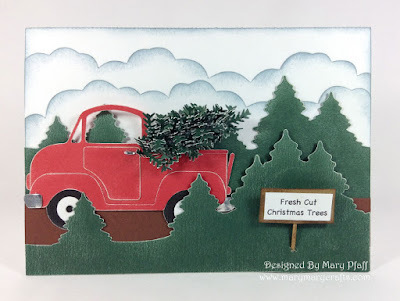 I created this card using My Treasured Kutz SVG digital files: MTK-D-1083 Old Truck, MTK-DB-1094 Winter Mountain Scene Background Card. Along with the die, MTK-CK-4098 Evergreen Branch. I cut it out, sanded, inked and made the tree in the back of the truck. I cut ten Evergreen Branches to create the tree. I then sanded, folded and glued them to a toothpick, then attached them into the bed of the truck. I hope this inspires you to step out and create. Thank you for hoping over. I love this card. Love the digi trees border/background and the "tree" in back of the truck. WOW another truly beautiful card! I bet people who get your cards save them and put them out year after year, I know I would, TFS!! I am in LOVE with this card! I adore the entire creation - I MUST try to re-create this one - Thanks for sharing with us! I love your card. The truck would be great for my father and the tree in the back looks so real. Better than the ones you see in the stores for doll houses. Fantastic card. Love the layering! Super cute. That truck is super cute! I can't wait to use it on a card. great job!